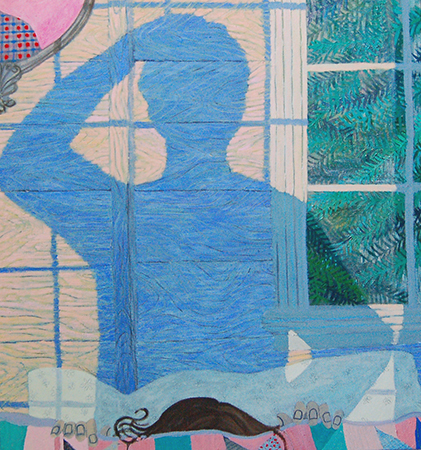 Giordanne Salley, Morning Shadow, 2016. James Cohan is pleased to present Intimisms, a group exhibition that considers the continuing legacy of the Intimists. A group of late 19th and early 20th century artists that included Jean-Edouard Vuillard and Pierre Bonnard, the Intimists created jewel-like portraits of family and friends in richly-colored interiors during moments of domestic quietude. Organized with artist Aliza Nisenbaum, the exhibition features 26 historic, established, and emerging artists and is on view at the gallery’s Chelsea location from June 23 through July 29. For press inquiries, please contact Jeffrey Waldron at jwaldron [​at​] jamescohan.com or T 212 714 9500. For other inquiries, please contact David Norr at dnorr [​at​] jamescohan.com or T 212 714 9500.